person legally authorized to take charge of his interest in the same. the petitioner without a Guardian. by the Court appointed Guardian agreeably to the prayer of the petitioner." Pennsylvania Wills and Probate Records, 1683-1993, indexed records and digital images, Ancestry.com (http://www.ancestry.com, accessed 3 May 2016), Montgomery County > Orphans Court Dockets, Vol 13-15,1857-1866, Volume 14, page 477 (image 698 of 1066), William Henry Auble petition for guardianship. 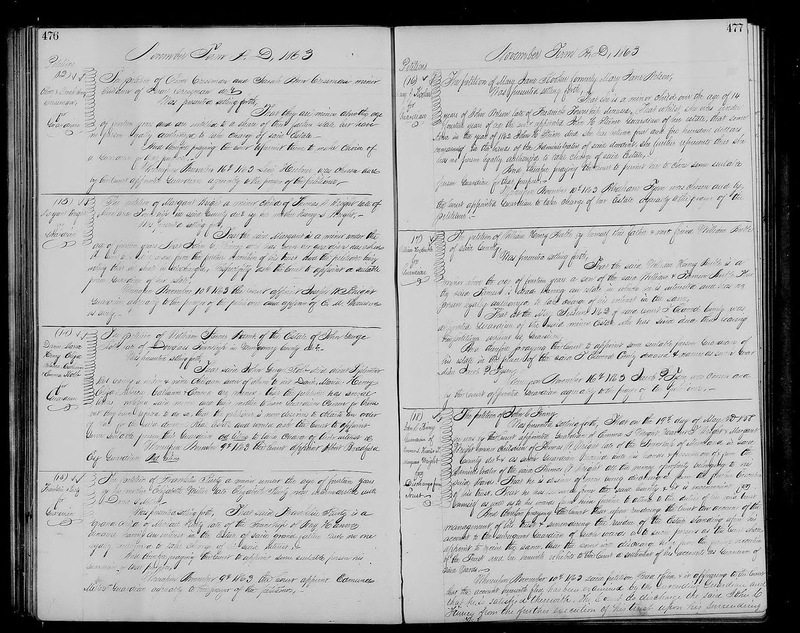 This is the second of two guardianship records for William Henry Auble in the Montgomery County, Pennsylvania Orphans Court records. It provides his full name, his age, and the names of his parents. Apparently, his mother, Tamsen (--?--) Auble, died before 1860 in Montgomery County with an estate in which William Henry Auble had an interest. A Guardian was appointed in 1862, but the Guardian died, so this petition is to appoint another Guardian to protect William Henry Auble's interests. It is likely that his father, William Auble, also had an interest in the estate of his wife, and therefore could not be the Guardian of his son. William Auble is the son of John and Anna (Row) Auble, my third great-grandparents, and the brother of my second great-grandfather David Auble (1817-1894), making him my second great-granduncle. Both were named in the will of Elizabeth Auble (1814-1899) of Philadelphia, William Auble's sister and my second great-grandaunt.